Garden Wild Flowers New Watercolor Original. Pink hollyhock, white daisy, pink coneflowers, yellow tansy just a few of the beautifully illustrated watercolor garden wild flowers by Laurie Rohner. The paper is 300 lb watercolor high quality heavy rag paper. The flowers dance vibrant under the blue skies painted with watercolor detailed with ink. Signature: Signed on front, title,date,signature en verso. The paper is 300 lb watercolor high quality heavy rag paper. I like to mount the paper on matte board and frame with a white or metal frame. 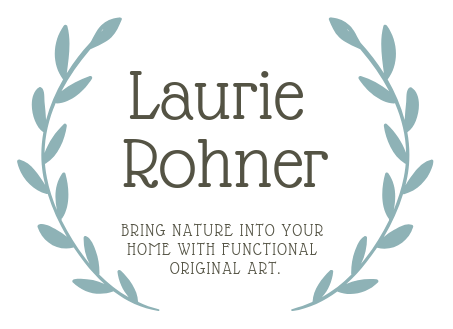 The delicate custom work of Laurie Rohner. Shop for Nature Art : I work in detailed garden flower watercolors, unique hand painted furniture including whimsical garden flowers with bees and nature illustrations and Vermont oil landscapes. My work is unique and custom I pay great attention to quality and details. Laurie creates watercolors on paper, canvas, farmhouse found objects and custom handcrafted painted furniture. I am a nature artist, interior and furniture designer, botanical and nature observer. Currently working on detailed delicate garden flower watercolors and woodland Vermont oil landscapes. My art, paintings, murals, and custom painted furniture are investment pieces. ​I live in the quaint town of Brandon Vermont in an old home where I work in my studio. Always ready to welcome you is my fun loving chocolate Standard Poodle, Jessie James. Worked closely with Sotheby’s in NYC chair interior designer in restoration of painted chairs. Head designer/owner of a NJ flower shop. Trained with two furniture makers learning furniture design and woodworking. Participated in many shows and fairs during my career, achieved awards for my work which is collected by many world wide.